A log option is an option that is set for individual messages. The log option is configured in QMessage Monitor’s automatic responses (auto-replies). When a message is received in one of the monitored message queues and matched against an automatic response, QMessage Monitor assigns the log option defined in the automatic response to the message. Leave Message on Message Queue? Display Message in QMM Console? Copy Message to QMM Activity Log? You can also think of a log option as defining a number of decisions that have to be made for a message. These decisions are partially independent from each other. The decision about whether to leave a message on the queue or to delete it is independent of the decision whether a copy should be written to the Activity Log or not. In contrast, the decision about whether to forward the message to the Console is dependent on the decision to leave the message on the queue or to delete it. The following flow diagram depicts this logical structure. 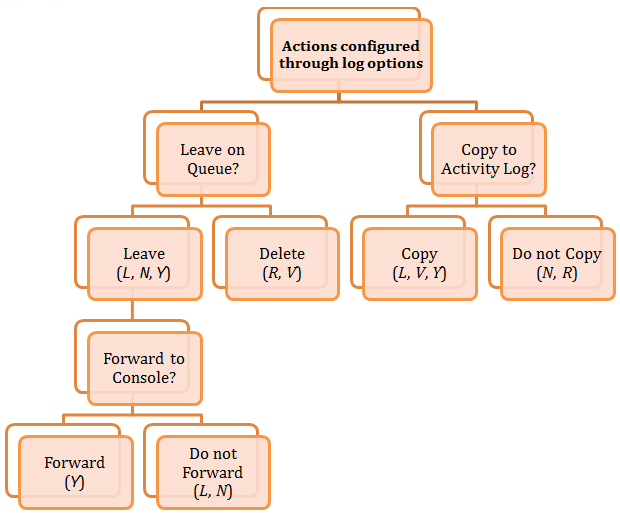 It shows a decision tree for actions configured through log options. Only messages that are on a queue can be forwarded to the Console. If a message is deleted from its queue, it cannot be displayed in the Console. A message can be forwarded to the Console but not displayed. A message that is forwarded to the Console can still be filtered out in the PC Console through the local filter settings, in which case it is not displayed. In all other cases, if the message is forwarded to the Console, it is also displayed there. This applies to all active instances of the green-screen and the PC Console. If multiple automatic responses match a message, the last automatic response matched defines the log option that is actually applied.